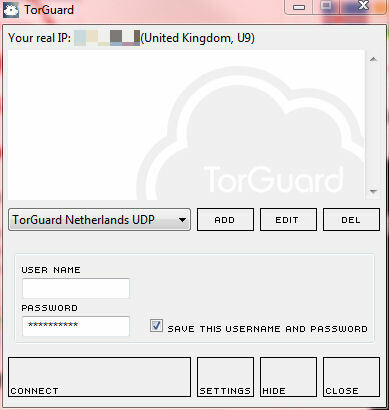 If you are looking for an affordable VPN service which can provide you with a sophisticated level of anonymity and protection while you are using torrent services, TorGuard may be the perfect VPN for you. 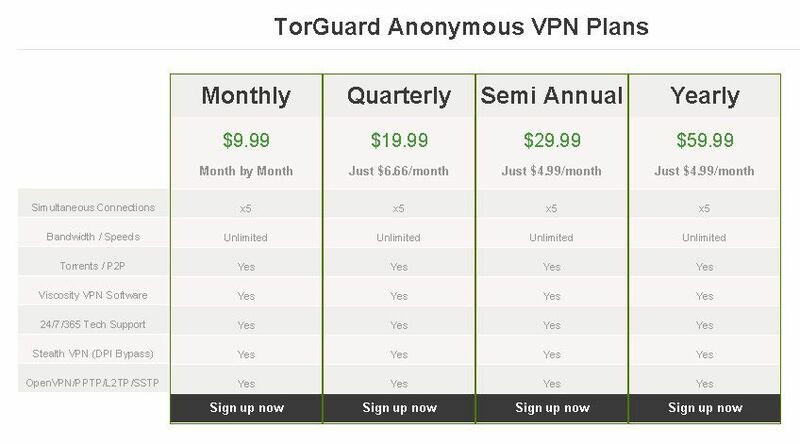 TorGuard offers general VPN services, but most of their products are geared towards torrent users, especially on Bittorrent. All the service packages are paid (no free service), but there is a 24-hour free trial, and you do not need to provide a credit card to try it out. You want to protect your personal identity when you are using Bittorrent or other P2P sharing services. A lot of other VPN services actually do not encourage you to use P2P, and some outright forbid it. This service is a much better choice for you if you are primarily interested in a VPN for this purpose. The product was designed specifically for your needs. Protect your identity while you are browsing the internet generally. TorGuard may focus on anonymous P2P sharing, but they also have a VPN service which you can use to protect all of your online browsing and transactions. This is a great choice for P2P and general internet use. Because you can use TorGuard on pretty much any operating system, you can use it on pretty much any device. Whether you have a laptop or desktop PC or Mac, TorGuard should work great for you. You are allowed to choose between OpenVPN and PPTP, which maximizes your compatibility options. You can also use TorGuard on your iPhone or Android mobile device. You can use TorGuard on up to 5 devices at once, which is pretty great! TorGuard is an entirely paid service. There is a price for every tier. There is a 24-hour free trial which you can register for without a credit card. The good side of this is that you can stay anonymous while testing the service, and you do not have to worry about the company automatically charging your card at the end of the free trial period. The bad side of it of course is that one day is not a very long test phase. There is a 30-day full money refund guarantee on all the paid packages, though, so you can look at your first month as a kind of extended risk-free trial. TorGuard offers four tiers of service. Unlike most VPN service tiers offered by other companies, they are not really so much about levels of quality as they are about different areas of focus. 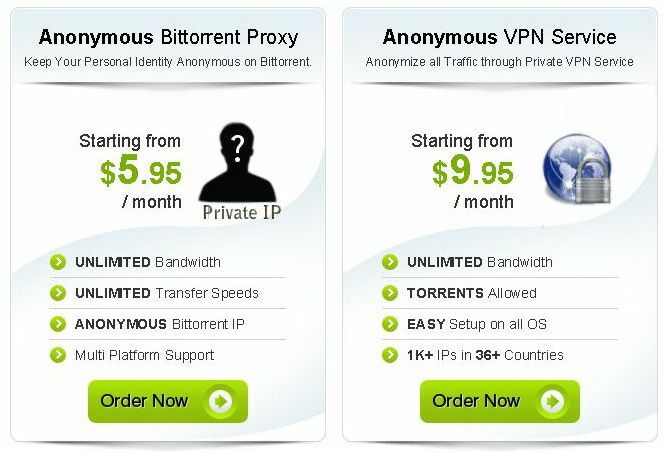 Anonymous Bittorrent Proxy: Starting from $5.95 per month. This service is of course focused on protecting your identity while you use Bittorrent to share files. Features include unlimited bandwidth, unlimited transfer speed, an anonymous IP address, and support for all platforms. Torrent VPN Service: Starting from $4.99 per month. This is a more generalized version of the service above, ideal for all P2P sharing. Features include unlimited bandwidth, an anonymous torrent IP, no installation required, and easy setup on all operating systems. The drawback over the Bittorrent Proxy above is the transfer speeds, which may be limited. The advantage is that it is useful on other P2P sharing services, and not just Bittorrent. Anonymous VPN Service: Starting from $9.95 per month. This is the most expensive TorGuard service package, and the most functional. This will protect your browsing while you are using torrents and doing other online browsing and activities. Features include unlimited bandwidth, torrent protection, easy setup on all operating systems, and more than 1,000 IP addresses in more than 36 different countries around the world. Anonymous Proxy. This service costs just $5.00 per month. Features include unlimited bandwidth, unlimited speeds, access to more than 100 servers, sock5 + http proxy, and complete protection of your privacy. This is a great deal and includes free setup. TorGuard offers a number of ways to pay, including credit or debit card, PayPal, OKPAY, and even Bitcoins. You can pay anonymously through the pre-paid PIN system, which is a great feature if you are extra concerned about your privacy. There is a 30-day money-back guarantee when you use TorGuard. If you are not fully satisfied with your first month of service, you can request a refund and get your money returned to you. Note that this does not apply if you go over 10GB within the first 30 days. So if you are using the 30-day period as an extended trial, be sure you stay under that limit. If you order a “fresh” Dedicated IP, this is also non-refundable (but you can still get a refund on your subscription cost). There are more than 1,000 IP addresses in more than 36 countries (at the bottom of the page, it says 25 IP addresses in 6 countries, but judging from the much larger country list in the FAQ, that is way out of date—still, you may want to contact customer service and double check with them directly). A number of server locations are available in the US, as well as locations in Canada and Mexico. Many choices exist throughout Europe as well as Asia, South America, and even Africa. In fact, there are more servers for Africa with TorGuard than any other VPN we have reviewed to date. A server in Australia is available as well. Not that torrents are not available in all countries and cities. Bandwidth and speeds are unlimited no matter what type of service package you choose to purchase. TorGuard is very flexible; you can choose between either the TorGuardVPN lite client, a customized proprietary interface, or Viscosity. The “lite” client is of course the simpler, easier one to use, but Viscosity is great for power users who want more features and options, like IPv6 leak protection. It also comes with an enhanced graph that shows your status. Overall, users report that this is a stable VPN service, with the exception of those on 4G networks, who report that the program regularly disconnects them. Those same users report that the program is fine on WiFi, so this appears to be a bug specific to 4G networks. Hopefully the company will get it resolved soon. Your speed will depend on a number of factors, including your connection and your ping, but download rates typically range from 5mbps to 30mbps (sometimes faster). Users report that the speeds they get with TorGuard are comparable to those they get without it, so there are no concerns here. This is extra important with TorGuard, because odds are you are interested in using this service for downloading files! You will have no security concerns with TorGuard, which maintains no logs of traffic or downloads. Since you have the option to pay anonymously, you do not need to worry about your billing information either! Encryption through OpenVPN is either 256-AES or 128-bit Blowfish, depending on which server you are connected to. Blowfish is not the best security (it is not bad, but could be better), but is offered to enhance speed, which the company says is more important to most of their users. Responsive to concerns, they are adding more 256-AES connection points as per user requests. In theory, you can contact TorGuard’s customer service team via their live chat help desk, but it generally seems to be unstaffed (sadly this is pretty typical with VPN companies). Alternately, there is a ticket system which you can use to submit an inquiry. Most users report these responses are slow, so that is not great. We did not find any specific complaints about customer service while we were doing our research. TorGuard is highly rated on Google Play, where more than 340 users have given it an average of almost 4 stars. Most of the users who have had problems with TorGuard complain about the 4G issue, so if you are looking for a VPN to use on 4G networks, you probably should choose another one or wait for TorGuard to fix their bug. Aside from that, the majority of users seem highly satisfied with the program and the pricing packages. If you are looking for a VPN to protect your anonymity while you are downloading and uploading files on P2P networks, especially Bittorrent, you have found a great choice with TorGuard. Whereas other VPNs will try to prevent you from sharing files on P2P networks, TorGuard was built specifically to help you do it with speed, efficacy, and anonymity. Give the 24-hour trial a go and see if you like it. Remember to test it out on all the networks you plan to use the service on. Enjoy the peace of mind that comes with enhanced security while you are sharing files and downloading!